A Beginner’s Guide To NEU! 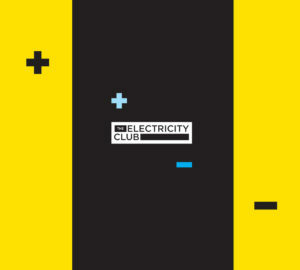 June 18, 2015 / electricityclub / Comments Off on A Beginner’s Guide To NEU! NEU! founder members Michael Rother and the late Klaus Dinger are two of the most highly renowned exponents of Kosmische Musik, a distinctly Germanic form that was unfortunately termed by the UK music press later as krautrock. Along with acts such as KRAFTWERK, CAN and TANGERINE DREAM, NEU! had helped restore a sense of German artistic identity, in reaction to the Americanisation of European post-war culture. But Dinger in particular was keen to disassociate NEU! from the krautrock scene, especially in relation to bands such as FAUST and AMON DÜÜL who he considered overrated and unmemorable. Rother had been a member of SPIRITS OF SOUND with Wolfgang Flür and the late Wolfgang Reichmann while Dinger was in THE NO and THE SMASH. The pair met after being recruited as members of KRAFTWERK in 1971. They even appeared on West German TV with Florian Schneider in a short-lived line-up minus Ralf Hütter, who at this point had temporarily left the band! On Hütter’s return to KRAFTWERK, Rother and Dinger left to form NEU! The name had been chosen by Dinger as “a protest against the consumer society”. Working with Conny Plank, the legendary producer acted as mediator between the pair’s quite different personalities and artistic aspirations. Dinger and Rother were never easy bedfellows even at the start; Dinger was a manic and confrontational character who wanted to be more than just the drummer, despite becoming synonymous with the motorik beat. Rother though was laid back and more conventional, texturing his guitars and later electronics to produce mini-cacophonies of sound that suited a more esoteric backdrop. Inevitably, the pair had a creative tension that produced great music which was experimental, yet accessible. However, by the time of their third album ‘Neu! 75’, relations between Rother and Dinger had got so bad that they agreed to conceive a side each, with minimal input from the other! But DAVID BOWIE had been listening and was particularly taken with the track ‘Hero’. Rother was subsequently asked to play on the album sessions for ‘Heroes’ in Berlin, but the collaboration never materialised… legend has it that this was due to interference from Bowie’s then management. After NEU! disbanded, Rother’s more ambient nuances led to him eventually becoming Germany’s answer to MIKE OLDFIELD, while Dinger continued with the magnificently spiky LA DÜSSELDORF and never really mellowed. A NEU! reunion in 1986 was aborted but Dinger released the recordings in 1995 without Rother’s knowledge. Rother later described this experience as “a rather painful disaster between Klaus Dinger and myself”. As if relations couldn’t get any worse, Dinger then toured and recorded for several years as LA! NEU? The project had a particularly loyal cult following in Japan where local label Captain Trip regularly released LA! NEU? material, but Rother felt that his former bandmate was trading off their pioneering legacy. As a result, Rother and Dinger took several years to agree on how to reissue their long out-of-print NEU! albums which were now only available on CD as vinyl sourced bootlegs. A deal was eventually brokered in 2000 with Grönland Records, the imprint of German singer / songwriter Herbert Grönemeyer who had compiled an eight CD box set entitled ‘Pop 2000’ tracing the history of German music. Dinger had been recording updated versions of tracks from LA DÜSSELDORF’s ‘Viva’ and some new compositions with Japanese musicians, but he sadly died in March 2008. In 2013, Grönland released ‘Japandorf’, a collection of the material Dinger had been working on prior to his passing. Since then, Rother has paid tribute to his friend and foe with the belated formal release of the 1986 NEU! sessions as ‘Neu! 86’, while also playing the music of NEU! live as HALLOGALLO 2010 with SONIC YOUTH’s Steve Shelley and TALL FIRS’ Aaron Mullan. More recently, Rother has been playing concerts comprising of work from throughout his career and has a new project MICHANIKA with singer / songwriter Annika Henderson. The 1972 eponymous debut album released on Brain Records outlined the musical manifesto of NEU! Produced by the Conny Plank, their aim was to develop a musical form that was distinctly original and not under the influence of the Trans-Atlantic culture that was now prevalent in West Germany. The almost trancey combination of a repetitive Apache drum mantra and a drifting layers of guitar interplay over a lengthy time space on ‘Hallogallo’ hit the spot and announced that Germany was indeed calling. The pressure was on NEU! to produce a worthy follow-up to their acclaimed debut and problems surfaced during the making of ‘Neu! 2’ when they ran out of budget. In a fit of madness or genius, depending on one’s opinion, Dinger came up with the idea to fill the second half of the album with speeded up and slowed down versions of their single ‘Neuschnee’ and its B-side ‘Super’, complete with needle drops! Other experiments included drilling an off-centre hole into the vinyl and using a faulty cassette player! Unable to recreate their template live as a duo, Dinger and Rother sounded out possible willing conspirators to augment the sound. While Dinger turned to his brother Thomas and friend Hans Lampe, Rother headed to the countryside in Forst to meet with Dieter Moebius and Achim Roedelius of CLUSTER. The trio’s resultant jams became HARMONIA. Based around simplistic preset rhythm unit patterns, the restrictions allowed them to experiment on tracks such as ‘Watussi’ and ‘Dino’. Contracted to deliver their third album by Brain Records, NEU! finally reconvened and resolved their artistic differences by supervising a side of ‘Neu! 75’ each, with Rother showcasing his thoughtful ambience alongside Dinger’s angry proto-punk; it was a bizarre but enjoyable listen. Rother’s haunting ‘Leb Wohl’ (translated as ‘Farewell’) with its plaintive piano was the stand-out on side one. This contemplative number was a combined effort as Dinger provided a slow, tapping rhythm and a mournful lead vocal. For his half of ‘Neu! 75’, Dinger had recruited his brother Thomas and Hans Lampe as percussionists and took the band in a more rocking direction than the ambient-inclined Rother cared for. When NEU! split, the trio became LA DÜSSELDORF and recorded their debut self-titled LP with Conny Plank. While the title track and its sister ‘Düsseldorf’ were fun thrash-outs, the instrumental ‘Silver Cloud’ was a meditative masterpiece with a shrill pipey overlay. It showed that Dinger could do melody and atmosphere like Rother. HARMONIA played several gigs including one in the presence of BRIAN ENO who later collaborated with them on what eventually became the HARMONIA & ENO ‘76 ‘Tracks & Traces’ collection. Recorded after Rother had finished his first solo album, the ambient rock of ‘Vamos Companeros’, with its choppy synth rhythm and improvised basslines, perhaps foresaw some of Eno’s later sonic experiments with U2 as PASSENGERS. However, the recordings remained unreleased until 1997. Relocating to build his own Random Studio in Forst, Rother’s first solo album ‘Flammenden Herzen’ (translated as ‘Flaming Hearts’) was recorded in the summer of 1976 with Conny Plank, with Jaki Liebezeit from CAN providing the percolating percussion. Although Rother had utilised synthesizers to great effect on ‘Isi’ from Neu! 75’, they took a greater role in his solo work. ‘Karussell’ had a distinctly European flavour and with its strong symphonic melodies, today sounds like a one-man ULTRAVOX. LA DÜSSELDORF’s second long player ‘Viva’ was their most successful album. There was the 20 minute madness of ‘Cha Cha 2000’, but the album also yielded the beautifully epic ‘Rheinita’. With big blocks of taped choir, synth strings and a simple pounding rhythm in the vein of THE VELVET UNDERGROUND, this glorious instrumental became the seed of OMD’s ‘Architecture & Morality’ album. The name incidentally was an amalgam of Dinger’s two great loves, der Rhein and Anita, his former long-time girlfriend. Rother’s second album ‘Sterntaler’ was a brilliant follow-up to ‘Flammende Herzen’. There was greater use of synths for melody lines as well as a more ambient approach on the track ‘Blauer Regen’. The moody textures of ‘Sonnenrad’ were the inspiration for ULTRAVOX’s ‘Dancing With Tears In My Eyes’. During the recording of ‘Systems Of Romance’, Billy Currie was given the album by Conny Plank and a few years later, he became inspired by its muted guitar line, steady rhythm and melancholic resonance. For his third solo album, Rother celebrated his love of cats and composed a two-part guitar symphony entitled ‘Katzenmusik’. The twelve numbered segments were each layered around variations of four different five-note melodies that recurred throughout the album. Within a pared down musical structure, Rother’s distinctive six string purr found its ideal setting. Beautifully melodic, it was to be Rother’s final collaboration with Conny Plank. 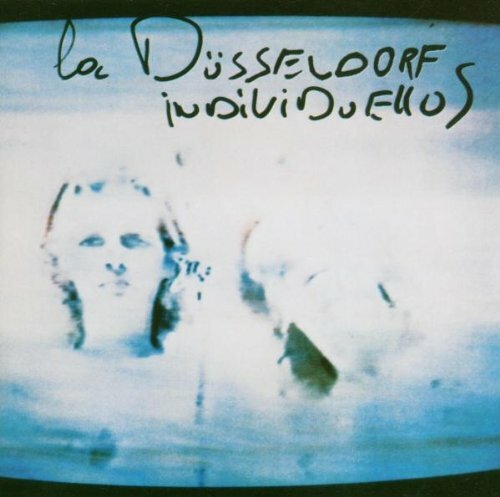 ‘Individuellos’ was the third and final official album from LA DÜSSELDORF. However, the band were thrown into turmoil when guest keyboardist Andreas Schell committed suicide. The album was abandoned but eventually released with what was in the can. A grand statement with layers of synths and piano that was simultaneously mad and melodic, ‘Menschen 1’ comes over like the blueprint for Phil Lynott and Midge Ure’s ‘Yellow Pearl’! 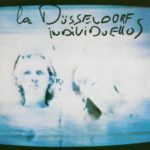 The final LA DÜSSELDORF release was a maxi-single featuring two tracks ‘Ich Liebe Dich’ and ‘Köksnödel’ that were intended for the fourth album. By this time, Hans Lampe had left so the Dinger brothers continued as a duo. While the Thomas Dinger co-write ‘Köksnödel’ was the most crisply electronic track LA DÜSSELDORF ever recorded, ‘Ich Liebe Dich’ was a sub-six minute brooding gothic drama that could have come from ‘Organisation’ period OMD. Rother’s fourth long player ‘Fernwärme’ was his first without Conny Plank, with whom he’d worked with on almost every project he had been involved in. But by his fifth album ‘Lust’, Jaki Liebezeit had gone too. Having acquired a Fairlight CMI to fully realise his own solo vision, ‘Lust’ was recorded without any assistance, with drum machines and electronics taking a more significant role. ‘Palmengarten’ successfully merged modern digital synthesis and sampling with organic guitar textures in a rich, glossy setting. With Thomas Dinger now having departed, various legal disputes with Hans Lampe stopped Dinger releasing material as LA DÜSSELDORF. So his next album ‘Néondian’ was effectively a solo project and released under the elongated moniker of KLAUS DINGER & RHEINITA BELLA DÜSSELDORF with the subtitle of ‘La Düsseldorf 4’. Conny Plank partly returned to the studio fold and although patchy, the collection featured several worthy highlights such as the tremendously anthemic ‘Mon Amour’. The brief NEU! reunion in 1986 saw digital drum computers and a Fairlight CMI brought into the mix by Rother, but continuing tensions with Dinger meant that the album was abandoned. However in 1995, the recordings were issued by Dinger as ‘Neu! 4’ in Japan without Rother’s consent. Despite this, there were several standout tracks, one of which was ‘Quick Wave Machinelle’ which sounded like a lost OMD demo. It was later revised in 2010 as ‘Euphoria’ for the Rother sanctioned release retitled ‘Neu! 86’. After the aborted NEU! reunion sessions, Rother returned to Forst with his Fairlight to record his seventh solo long player. With the new CD era dawning, ‘Traumreisen’ saw his work become increasing more ambient and sedate in a far cry from his NEU! roots. But ‘Lucky Stars’ was slightly more uptempo, verging occasionally on JEAN MICHEL JARRE territory with symphonic synths over a lighter motorik backbone. In many respects, it had several sonic similarities to Dinger’s Mon Amour’. A Rother compilation entitled ‘Radio’ was released and featured “6 Neue Stück”; these were unreleased recordings made between 1988 and 1993. There was more material than could be included on ‘Radio’, so these various pieces were spread over his subsequent album reissues as bonus tracks. Whether these recordings sonically fitted onto albums from 1977 or 1978 was debatable, but the beautiful ambience of ‘Patagonia Horizont’ was a wonderful, if incongruous jewel tagged onto the end of ‘Sterntaler’. Rother’s 1996 album ‘Esperanza’, while incorporating subtle hints of modern club beats, was verging on total new age and a comparative disappointment. After a recorded break of eight years came a return to form in the shape of ‘Remember…The Great Adventure’. The album forced a conceptual rethink and included vocals on several tracks by Herbert Grönemeyer. Featuring the dreamy tones of Sophie Williams, ‘He Said’ had a serene Nordic flavour with an emotive chord progression and a gentle but lively pace. Dinger’s posthumous album ‘Japandorf’ was started in 2007 with several Japanese musicians including his partner Miki Yui and Kazuyuki Onouchi. ‘Sketch No1_b’ was the result of a rocky jam between Onouchi and Dinger, with swirling synths and windy HAWKWIND sweeps added in for good measure. An early version had featured on the 2009 homage compilation ‘Brand NEU!’ as ‘Sketch 1_08’. ‘Japandorf’ was a best selling record on Grönland, an indication of the regard with which Dinger was still held. Posted in Lists & Beginner's Guides	Tagged with Brian EnoClusterConny PlankHarmoniaKlaus DingerLa DüsseldorfMichael RotherNeu!